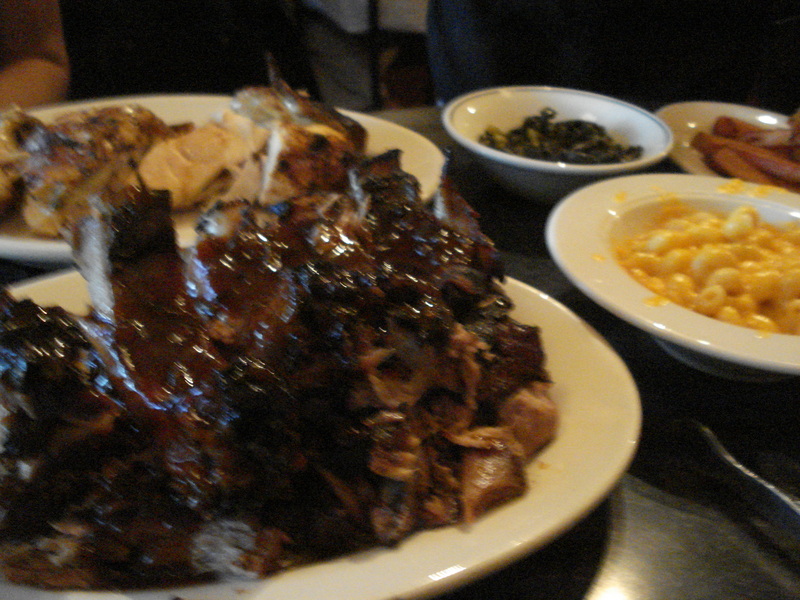 Brooklyn – maybe the land of promise for decent BBQ in the five boroughs. Since I’ve began this journey I’ve had the most tips about little hole in the wall places scattered throughout Brooklyn, but the one I checked out this week I stumbled across on my own. 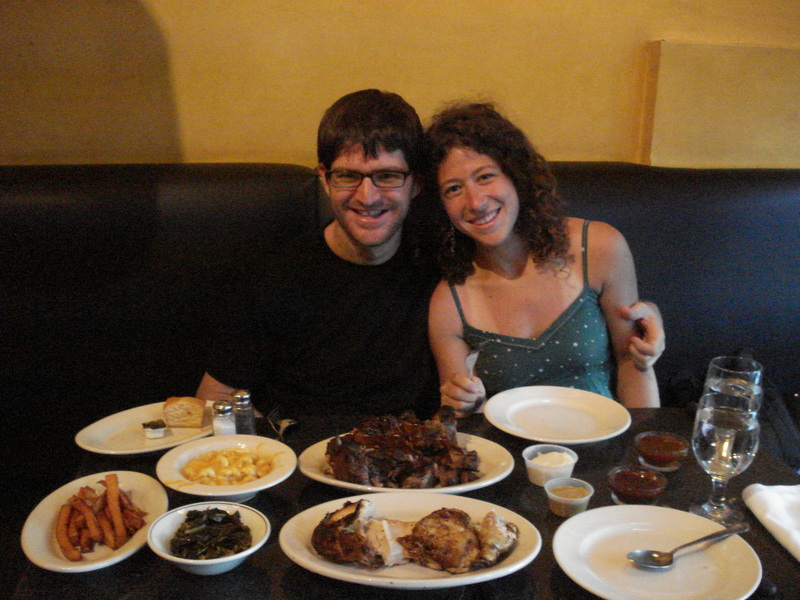 Jake’s Kansas City style BBQ in Red Hook looked promising, and didn’t disappoint. What’s more, I had the incredibly rare opportunity of sharing the experience with a complete BBQ rookie – a friend of mine who was a vegetarian for most of their life and only recently discovered the enchanting world of smoked meats. Look how excited we are!!! Jake’s is a humble looking place; there is no hype (yet anyway). The food is quality, but no one thing stood out. The prices weren’t amazingly cheap, but all in all it felt like a good value. Sandwiches hung in the $7-$8 range. Considering this was a special occasion, I wanted a sampling of the wide range of meats available, and Jake’s provided ample choices. Had I managed to gather together 4-5 people I would have gone with their full sampler which includes (take a deep breath) pork ribs, beef ribs, 3 sausages, pulled pork, beef brisket, pulled chicken, a whole bbq chicken, and three sides for $35.00!!!!!! I considered just ordering it anyway and having a week’s worth of leftovers, but found an even better deal: The BBQ meats sampler which included Pork Ribs, Pulled Pork, and Beef Brisket and two sides (went with sweet potato fries and collard greens) for $24.99. Not a bad deal, but I am never satisfied with just not a bad deal, so I hunted down a coupon on their website good for (if you can believe it) a half bbq chicken with a $25 purchase. Ordered an additional side of mac and cheese for the sake of posterity (though I’m sure they would have let it slide) and you have an enormous amount of food that could have easily fed three people for $28. 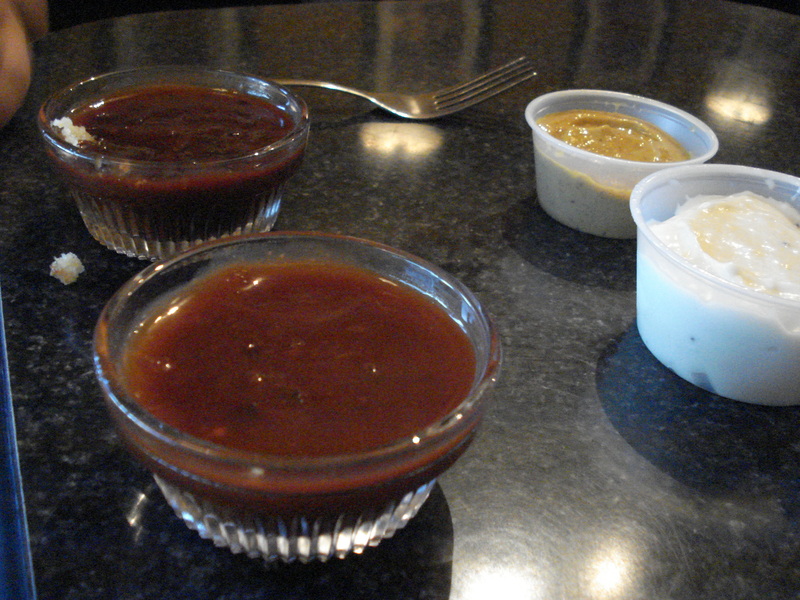 Its usually a good sign when the BBQ sauce isn't bottled. Everything was great, but like I said, nothing was the absolute knock-out champion. I guess that’s the sacrifice of a BBQ joint with a pretty diverse menu. The pork ribs were succulent, the pulled pork was smokey, the brisket had just the right amount of marbling and a little edge, the chicken was crispy and tender, and the two sauces (regular, and honey-something) offered plenty of interesting notes. 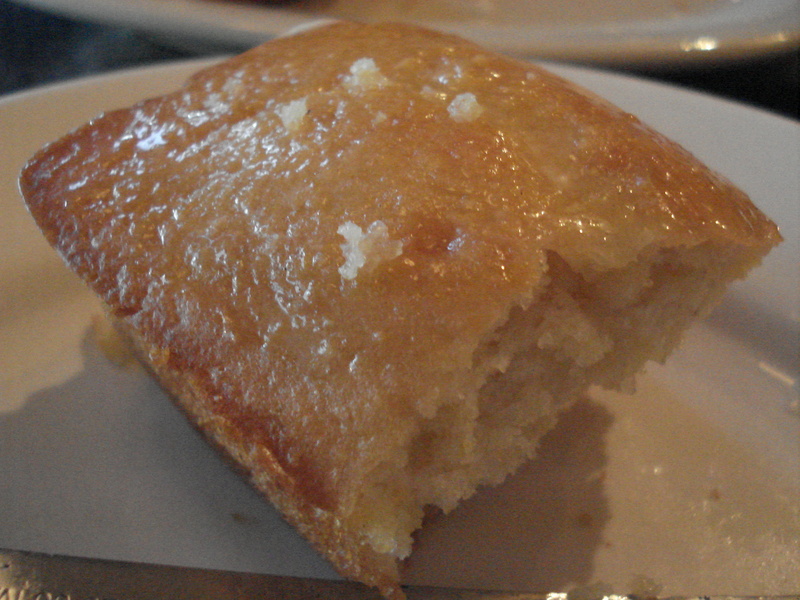 The cornbread was also awesome, with just the right combination of sweet and savory. I really don’t want to say much more about the food, so much as I just want to convince you to try this place. Rather than wait for 3 hours to get into Dinosaur on a Saturday night, expect no wait at Jake’s, or make a reservation (which I did, although it wasn’t needed). The service was perfect, with our waitress sharing in my excitement for our meat-virgin friend. If you’re still reading, you probably weren’t deterred by those two words ‘Red Hook’. Part of what makes Red Hook an especially great neighborhood is its difficultly to get to. Its off the beaten path, which to me, gives a kind of Key West quality right in the middle of the metropolis. But Jake’s won’t let you be discouraged. In addition to delivering to a wide range of neighborhoods (even as far as Kensington!!) they have a reverse delivery system where they will actually pick you up and bring you to their place. What more could you possibly ask for? If you don’t live in their delivery/limo service range, simply take any train (BDFG2345NQACMR anyway) to a stop within their range. If this STILL isn’t enough for you, email me and I will come pick you up wherever you live, drive you there myself, and buy you dinner. **If your issue is making the trek to Red Hook only for dinner (something that’s delayed my visit for weeks) check out a show at one of my favorite venues – the Jalopy Theatre – after dinner. Its 4 blocks south of Jake’s on Columbia St and there is great Americana/Acoustic music just about every night of the week for a $10 cover. Check their calendar. I’ve never been so excited in all my life.